D-Link introduced their Exo series of routers in early 2016. Since then, the traditional router form factor with middle-of-the-road specifications has become a mid-range product for all networking product vendors. 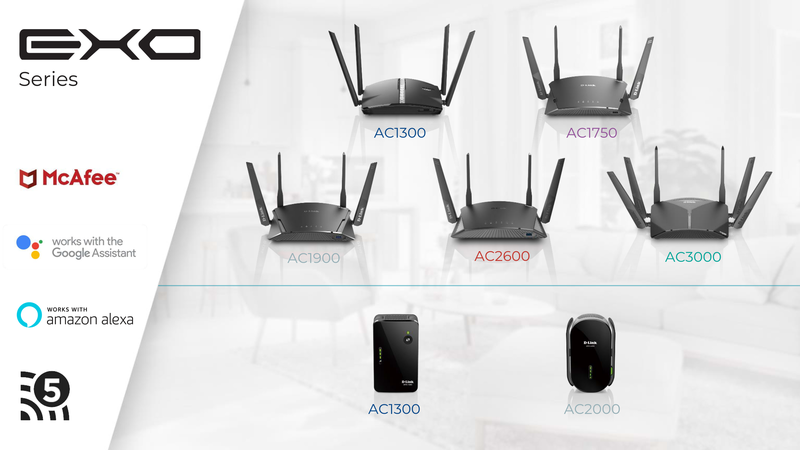 In order to stand out in this competitive market segment, D-Link is announcing a new lineup of 802.11ac Exo routers and extenders with mesh networking support. The products are being made more attractive with the bundling of a McAfee security suite. D-Link is also bringing in elements found commonly in the whole-home Wi-Fi system market (such as easier plug-and-play setup, and seamless addition of endpoints as requirements evolve over the deployment time period) into the Exo lineup. All routers and endpoints include a gigabit wired port. The McAfee security suite adopts a cloud-based approach, and threats identified in one deployment are automatically recognized and passed on to other deployments for better security. In keeping with the current marketing buzzwords, D-Link and McAfee are using the 'cloud-based machine learning' moniker to advertise this real-time threat detection and database update approach. The security suite also includes a host of commonly requested features like parental controls and IoT device protection. The Exo routers come with Google Assistant and Alexa support. It also includes a security suite with 2 years free subscription to McAfee anti-virus for every device in the network and a 5 year subscription for the IoT device protection scheme. Combined together, these services represent a $700 value according to D-Link – this makes the Exo lineup a very attractive proposition in its market segment. Other networking vendors also have similar tie-ups for the security aspect, but, we have not seen anything approach the value of the D-Link / McAfee combination yet. Additional details about each product are available in the gallery below.